Claire Adams was a star during Hollywood's silent screen era. She left that world behind her when she married Donald 'Scobie' Mackinnon and came to live in rural Victoria. Canadian born Claire Adams (1898-1978) began acting in films at 14, eventually appearing in over 40, including The Big Parade, the second largest grossing silent film in cinema history. Her leading men included Tom Mix, Adolphe Menjou and Lon Chaney but she often quipped her favourite leading man was animal ‘actor’ Rin Tin Tin. Adams married film producer Benjamin B. Hampton in 1924 who died in 1932. In 1937 Adams was in London and about to take on a job as a film executive. At a party she was introduced to Australian sheep farmer Donald ‘Scobie’ Mackinnon. It was love at first sight and they married three weeks later. “We’re getting married tomorrow,” Mackinnon recounted to reporters, after bursting into Adams’s hotel one morning. In 1938, the Mackinnons arrived at Mooramong, the sheep station near the town of Skipton. 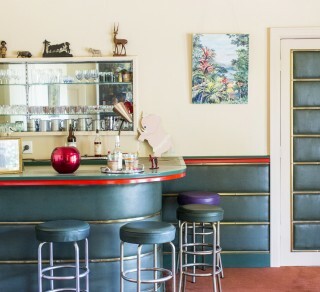 They transformed the Victorian era homestead into a fashionable abode of Art Deco elements and Moderne design and divided their time between Mooramong and a Melbourne town-house. After his death in 1974, Mackinnon left his entire estate to Adams. On her death, she bequeathed Mooramong to the National Trust of Victoria for the creation of a wildlife sanctuary and fauna and flora park. The collection documents the lives of Claire and Scobie Mackinnon at their country house, Mooramong. The art deco and moderne design house also featured a tennis court and walled garden. Claire Adams’ love of animals, particularly horses and dogs, is evident from her film career, which include two adaptations of the novel Black Beauty. Her oft-cited claim that Rin Tin Tin was “her favourite leading man” was perhaps not a joke. Although retired from the film business, Claire appeared in many home movies made by the couple around the property. They even installed a home theatre and hosted movie nights for their guests. Design Number 1077, introduced 1931. French glass craftsman René Lalique (1860 - 1945) ranks as one of the most influential designers of the 20th century. A pioneer in glass manufacturing and decorative techniques, at his studio glass was press moulded and ornamented with acid etching or 'patine', an enamel solution. Marketed around the world, Lalique was advertised in Australian magazine 'The Home' and was a popular luxury item. Claire Adams Mackinnon decorated Mooramong with moderne objects and bibelot. 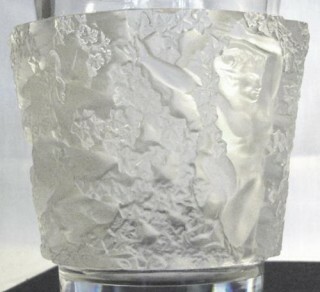 Her Lalique collection features several well-known designs, many of which were introduced in the 1930s. 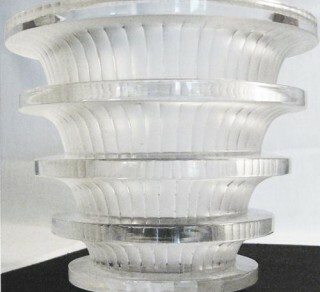 Design Number 10-922, Heave Glass, introduced 1938. Design Number 1081, introduced 1930.